Issue #42: The answer to the ultimate question of life, the universe and everything related to Craft CMS. This issue's big news is the critical security patch for Craft 2 sites. Check out the "Top stories" section for details. Don't stop there though. There's plenty more to discover in this issue. As always, thanks to the sponsors! Say hello to them. Sifter is our featured sponsor. Sifter is a bug and feature tracking tool to keep your projects on time and organized. Check it out. Also welcome Craft Sherlock to CLL. This plugin will help keep your Craft site's security in check. If you have Sherlock installed you know about the recent security update already. Get Sherlock here. Solspace is back again this issue with a sale on the power tool for forms, Freeform. Get a copy while it's on sale. Grab your towel! Let's hit the links. On June 7 there was a critical bug fix for Craft 2.x. If you haven't updated your Craft 2.x site yet do so right now. There been one additional small update since this security patch as well bring us to v2.6.2983. CVE Details lists security vulnerabilities of all kinds of software and this is their (short!) page on Craft CMS. If you're wondering about the same list for Wordpress, here you go. Just get a refill on your coffee first. Standuply published data about IT-related communities on Slack. The results are broken down into categories. 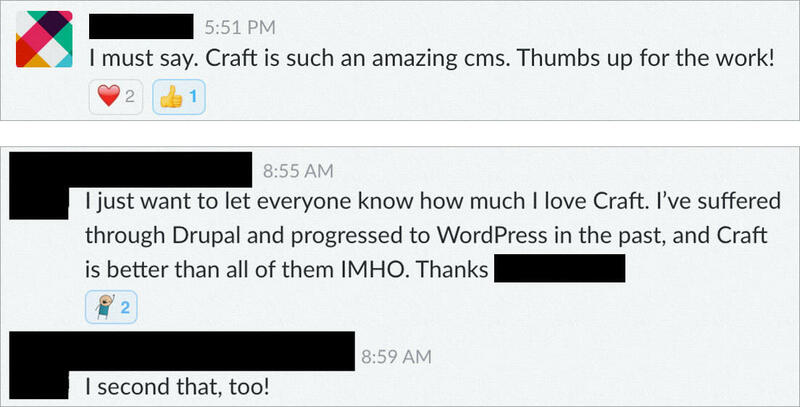 Craft CMS comes up on top. If you're not on the Craft Slack group, sign up and join in. Schedule a draft to auto publish? There's no more includecssresource in Craft 3 plug in development. What do you do? Use Asset Bundles. You can see this in action in the Rich Variables plugin for Craft 3.x from nystudio107. This entry springs from my own development issues. I asked on Slack and the community stepped in to help. What is the easiest way to include bootstrap in Craft? Another knowledge drop by Andrew Welch. "A SaaS website created with Craft CMS was logging out sessions after 30 minutes; here’s how I solved it." In Slack it was called "required reading for anyone using an Ubuntu VPS." Front end implementation for Apple Pay in Craft, using the Stripe implementation. As I write this, the instructions on implementing this code block are not yet written, but you may still want to check it out. Dylan Smith has shared his Docker build for Craft 3. A question by Selvin Ortiz in Slack lead to a brief discussion on setting Craft 3 configuration options in config files instead of storing those values in the database. Brandon pointed to the Craft 3 config options page showing this is not possible. Your .env file will have been loaded by the time Craft gets to parsing the configs files so you can use getenv() to set the config options based on your dev, staging, production environments. Sherlock is a security scanner and monitor to keep your site and CMS secure. Install the plugin, tweak your site's security settings, set up scheduled scans and rest assured that if your site ever fails a scan then you will be notified immediately. Be proactive, stay secure. Freeform is the most powerful form building plugin on the market for Craft. The intuitive live preview field layout editor gives you full control to create simple or complex multi-column and multi-page forms. It also includes flexible email notification options, powerful and flexible templating, and has options for several API integrations. On sale now for only $69! Rev asset urls with date modified timestamps with Craft 3 with this plugin from Newism. Recover abandoned Commerce carts, and increase sales by Superbig. This plugin notifies your customers that they have abandoned their shopping carts and did not finish the complete order process by Digital Agency WHITE. This plugin from Superbig let's you create short urls on Craft 2.4.x and above. Superbig bring another plugin to the Craft world. Configurable redirect after logging out. Fred Carlsen does it again, with this addition to his plugin library you can generate CSV and XLS files in your templates. Double Secret Agency has opened a store for all their plugins. Brandon made a suggestion for making the plugins you write for Craft CMS more discoverable on Github, "you should just give your repos a craft-plugin topic" and for Craft 3 plugins, add a 2nd topic of craft3. But what is a "topic" in Github terms? Read the Github topics help page here. Newism has released a collection of impressive looking field types for Craft 3. I'm looking forward to using these. Keyboard jockey alert: This plugin was mentioned back in it's v1 days in Issue 23 but it's received a big update you might want to check out. It provides a command palette when you navigate through the backend in Craft. There is a great new case study on how people are using Craft on the official site. Names redacted to protect the amazed. A PDF on CMS choices last updated in January 2017: "Unlike WordPress, you may not have heard of Craft. And that, I think, is highly unfortunate. As you’ll read below, we love Craft here at Viget and tend to prefer it over WordPress." Need musical accompaniment? Here you go. Plates is a native PHP template system that's fast, easy to use and easy to extend. It's inspired by the excellent Twig template engine and strives to bring modern template language functionality to native PHP templates. Run any browser online, including Chrome, Firefox, IE 8, IE 9, IE 10, and IE 11, and more. TLDR: Don't use icon fonts. Reactjs vs Vuejs - What to Choose?